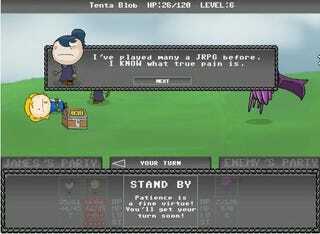 This flash-game parody of JRPGs perfectly nails every device, trope, conceit and theme of the genre. Hang in there - even if the odds seem ridiculous, someone shows up to give you 200 gold to buy the JRPG sword. At which point you face even more stupid-ridiculous odds, and the game becomes either a snide commentary on the JRPG formula, or a subtle hint that it's really all about resource allocation. I made it to the level with three Cthulhu blobs and the Blobby Builder before saying the hell with it. Anyone else get further?